While the best things in life come free, that’s not always true with technology. With more than 50% of CMS-based websites running on WordPress, it is undoubtedly one of the most popular platforms for conventional business websites. 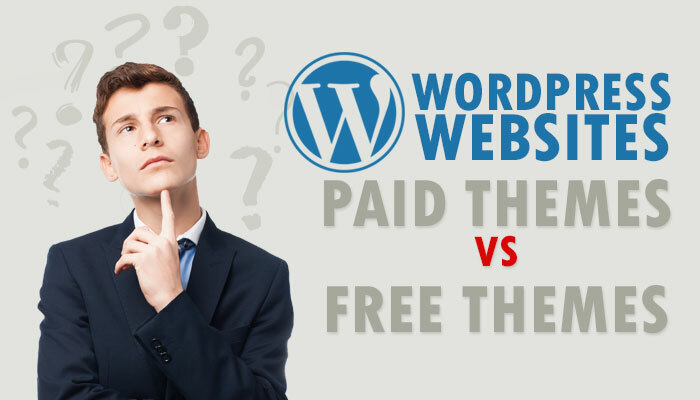 Customers often inquire with us whether to choose a paid theme or a free theme for their websites. In this article, we discuss the pros of free themes and paid themes to help you make an informed decision. Read on to find out which type of themes are well-suited to your needs. Let’s look at the pros of free themes to help you decide if free themes are your cup of tea or not. It’s Free: Free themes are a good choice if you are working on a limited budget. You spend absolutely nothing to get this theme working of you! Freedom to experiment: Free themes offer you the freedom to experiment with several themes, and see which theme gives you the most satisfactory results. Once again, you won’t be afraid of experimenting because you have spent nothing on it except for time. Ease of replacement: Free themes, unlike paid themes, do not have too many unique features and it is relatively easier to replace one free theme with another. Some common features like posts, pages, widgets, ordinary sliders, etc are available with almost every theme and you don’t lose much when you replace one theme with another. Simplicity: If you are going to make a simple website that needs the most common features, then paid themes may be an overkill. The best part of free themes is that you can quickly put up a simple website with very little changes. For any additional requirements, you can get free plugins. You get what you pay for is ancient wisdom. Here are some significant advantages of paid themes. Uniqueness: With paid themes, your website is more likely to be unique in design. This is due to a simple reason that far fewer websites are built on paid themes. Ease of use: Paid themes are usually bundled with plug-ins like visual composer, revolution slider etc., that help you build designs quickly, easily, and creatively. Not just that, but you also get excellent documentation about each of these products. Hence is makes building uniquely creative websites far easier. Frequent updates: Like any software, WordPress themes do have security flaws, and are prone to security attacks. Hackers on the internet are always on the lookout for websites with such security loopholes. With paid themes, such loopholes are addressed from time to time via theme and plugin updates from their respective authors. Some times, these updates also cover additional features and bug fixes if any. Regularly updating your theme will help in minimizing security risks and gaining advantage of newer versions. Ease of customization: Paid themes offer plenty of theme options, and are easier to customize. For example, simple changes like changing the color of a menu, or the background, or the font can happen at the click of a button without much of CSS changes. Support: A paid theme comes with technical support from its author, usually upto 6 months. You may subscribe for additional support as required. This will be helpful if you are facing any problems with the theme or you need programming support in enhancing any of the features in the website. Compatibility: As and when WordPress updates are released, your paid themes receive updates as well from their authors. Paid themes have compatibility with most plug-ins on the internet, and will serve a great deal for catering to your changing business needs. Compatibility of paid themes extends to more browsers compared to free themes. If your answer is YES to at least one of the above questions, then paid themes suit your requirement better.